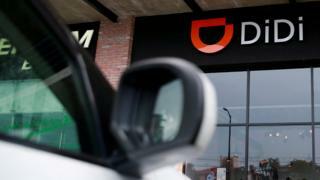 China has ordered the indefinite suspension of ride-hailing giant Didi Chuxing's carpool service after the murder of two people. It will remain in place until better standards are implemented, Chinese state media says. Heightened background checks of drivers for the web-based providers have been ordered while operators must also adopt new technology to curb risks. Didi first suspended its carpool last month and admitted safety lapses. The company has been under intense pressure over the killing of two female customers. The most recent case came in August, when a 20-year-old woman was raped and murdered by the driver. The cases had caused an outcry with calls for a boycott of the service. Tuesday's announcement by the Ministry of Transport led to tens of thousands of comments on China's dominant social media platform Weibo. "Didi is bad enough, but compared to others, this rotten apple is actually the one with the least insects," one user said. Another one adds: "The bad guys won't disappear simply because Didi will disappear." Other users are pointing out the service had "brought a lot of convenience" and that they are hoping the situation will be rectified. The carpooling or hitch services offer to match up people who are headed in the same direction so they can split the cost. The regular ride-hailing service by Didi and its competitors will not be affected by the changes. Didi Chuxing is the world's largest ride-hail company by number of trips.